Challenges come in our lives for a reason. They teach us, make us stronger and wiser. Some challenges can be pleasant and some very difficult. However we all have to face them and get through them. Our cooking challenges are not scary or difficult to face. They are fun and exciting. Every month I look forward to the shhh cooking secretly challenge. As soon as the participants are paired I eagerly wait not only to get my two secret ingredients but also to give my two ingredients. Unfortunately out of the 6 I have participated in so far, only one partner has cooked with the ingredients I gave to her. Not really complaining… they may have not cooked the dish due to some reason or the other. I have found the ingredients I have received challenging and fun. For this month’s challenge I got jaggery and milk as my two secret ingredients from Shailaja Reddy. She has a wonderful food blog, Sahasra Recipes. Because of makar sankranti just round the corner, til laddoos kept on popping up in my head. However, I have already blogged that recipe so had to think of something else. Jaggery or milk on its own are pretty simple ingredients, offering various dishes that can be made with them. However the combination is another story altogether. There are jaggery and milk kheers, but didn’t want to make kheer. It was like a last resort thing to make if I didn’t find anything else. And then I tumble across jaggery cookies and said, “yes that’s what I am going to make”. The cookies turned out really delicious. I loved the way jaggery added that caramelized taste to the cookies.Crunchy on the outside and soft inside. Only back draw was that the cookies became a bit soft in spite of storing in an airtight jar. So I just popped them back into the oven for 10 minutes under low heat. They stayed crunchy till they got over. 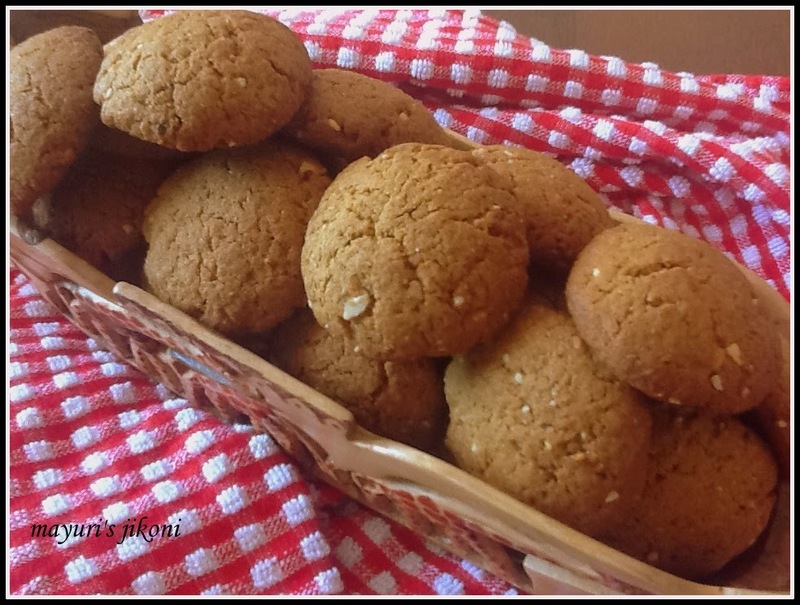 If I need to make ginger cookies again, its going to be this recipe— with jaggery ! Check out my new wooden basket. Isn’t it lovely? Made from one piece wood and handmade. Its unfortunate that our artisans are suffering because of lack of tourism. They make lovely stuff. Do you love challenges ? Preheat the oven to 180°C. Grease the baking trays lightly with butter. Sift flour, baking powder, soda bicarbonate and ginger powder together into a bowl. Mix in the almond powder. Put butter, sugar and jaggery in a pan. Heat the mixture over low heat. Stir till the sugar and jaggery melts. Take the pan off the heat. Add lemon juice, milk and ginger paste. Mix well. Let it cool a bit. Add the liquid to the flour mixture and stir with a spoon till mixed. Knead into a dough. Gently press it between your palms or flatten them about ¼” thick. Place it on the greased baking tray. Repeat steps 6 to 8 with the remaining dough. Place the rolled dough 1″ apart. Bake the cookies for 12 – 15 minutes till the cookies are golden brown. Remove the cookies from the oven and let them cool on a wire rack. The cookies will be soft but will become a bit hard on cooling. Don’t over bake the cookies. They will become rock hard and burnt cookies taste bitter. To get flat cookies flatten them more. I like dome shaped cookies so I tend to press them between my palms. If the cookies are too soft, then place them again in the oven at 100°C for 10 -15 minutes. Add any nut powder of your choice or add wheat germ. I prefer to use dark coloured jaggery for these cookies as it adds a lovely golden brown colour to the cookies. Do not overheat the liquid mixture. Just cook till the sugar and jaggery melts. I like the combination of almonds, Jaggery and ginger.How can I join the group of “Shhh cooking secretly”. Please help.